Hope you are all having a great week. I have been busy in the kitchen this week making fresh pasta that I will be posting soon. I can’t wait to see what everyone is sharing this week. Welcome to this Week’s Friday Frenzy! 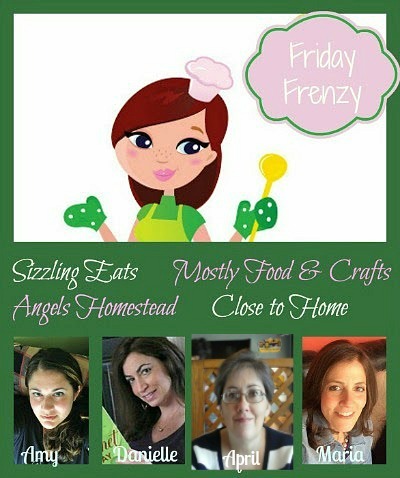 Close to Home, Mostly Food and Crafts, Angel’s Homestead, and Sizzling Eats welcome you to FRIDAY FRENZY where we come to share your Recipes, Craft projects, and whatever else you’ve been working on. When you link up to the Frenzy your posts will be featured on all four of our blogs for quadruple the exposure. Each week we’ll showcase a few of our favorites from the week before, and pin them on our Friday Frenzy Pinterest Board as well. By linking up to this party, you’re giving authorization for your projects/crafts/recipes to be featured with a photo and a link back to your blog, hopefully sending some readers your way. Summer is all about ice-cold drinks that can really cool you off. Check out this beautiful Raspberry Grapefruit Refresher from Divine Lifestyle. It is so pretty and features a raspberries which I have a ton of–time to make a refresher for my husband and I to enjoy this weekend! What kid doesn’t love Teenage Mutant Ninja Turtles? I know my three sure do so this Teenage Mutant Ninja Turtles Construction Craft from Living Off Love & Coffee is adorable for them. I will have to pick up the supplies tonight so they can each make their own to decorate their rooms! This next feature from last week’s link up is from Homegrown and Healthy. I really fell in love with this twist on traditional baklava. I love how she turned such a delicious dessert into little sundaes. These Boozy Baklava Sundaes would be the perfect adult treat to enjoy on a hot summer night. If you missed these awesome posts, be sure to click through their links to check them out! Congrats to those who were featured, and thanks again for linking up your posts!